A lot of fans criticized G.I. Joe for being goofy, but dammit, sometimes goofy works. 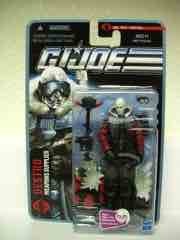 Take this Pursuit of Cobra Arctic Threat Destro, which took a popular character and applied one of the oldest action figure cliches in the book-- snow gear. 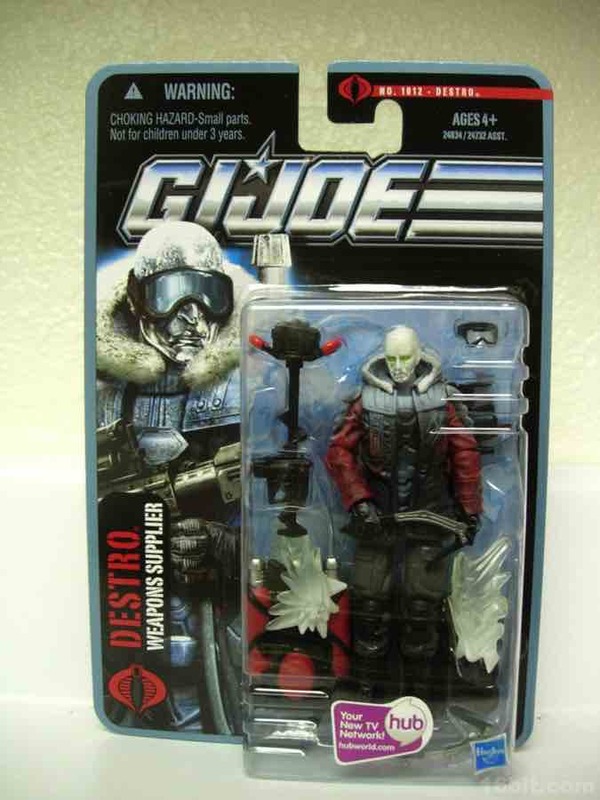 Generally Hasbro (as the Joes went) preferred to make new snow characters rather than old characters in new snow gear, but since the early 2000s they've moved into accepting more of this kind of thing. 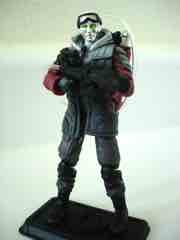 We've had a lot of Snow Serpents and even a polar version of Scrap Iron, but Destro? This is new, and as part of the second wave of the first post-movie line, it's quite endearing. It's also not without a major design flaw in the deco which really does hurt the product. 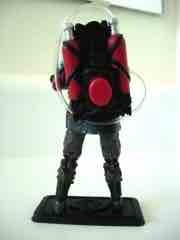 WARNING: If you plan to open this figure DO NOT display or store him with the goggles on. The goggles cause the white paint applied to the chrome head to melt off in a matter of days, leaving you with a goggle-shaped unpainted stripe on the figure's head. We bought a second sample due to the damage that the toy caused itself on the first one. Don't say we didn't warn you, collectors of the future! The articulation on Destro is nothing new-- you get the standard 25th Anniversary-style construction with a pretty decent range of movement, considering his bulky jacket. Since the jacket was sculpted open, the figure has no problems sitting as his hips are unrestricted. The garment is loaded with quasi-armor details, plus a moderate dusting of snow which you'll also find on his chrome head. 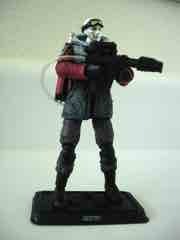 So far, we've had no problems with the snow "melting" off any part of the figure except for the head. 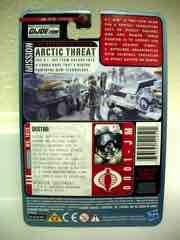 The figure is unusually fun-- basically, Hasbro said "Let's make Mr. Freeze but make him like Destro or something." And here he is. The green eyes peek out from behind the goggles nicely, but the long-term results of enjoying this accessory will guarantee damage to the figure. Also, the water-blasting backpack doesn't shoot water too well. 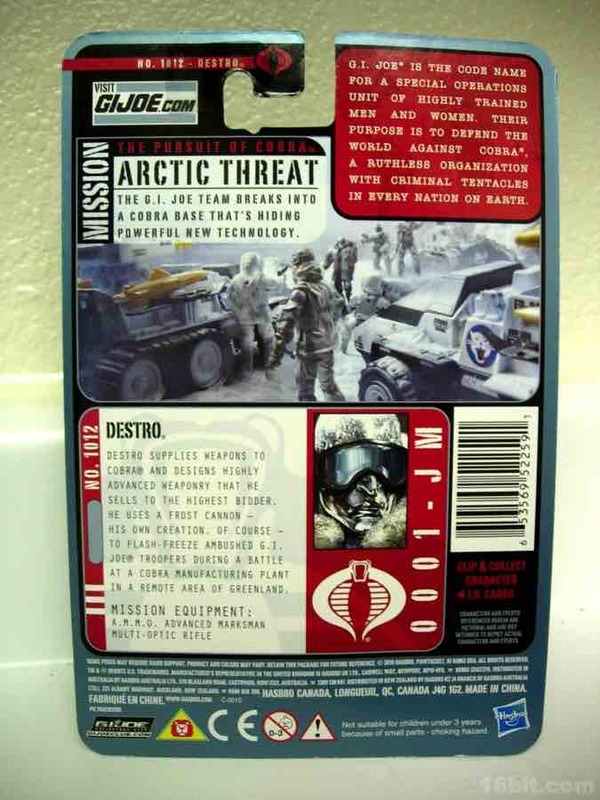 To make up for it, Hasbro included two snap-on ice accessories which you can attach to other figures to pretend Destro has shot and "freezes" them. 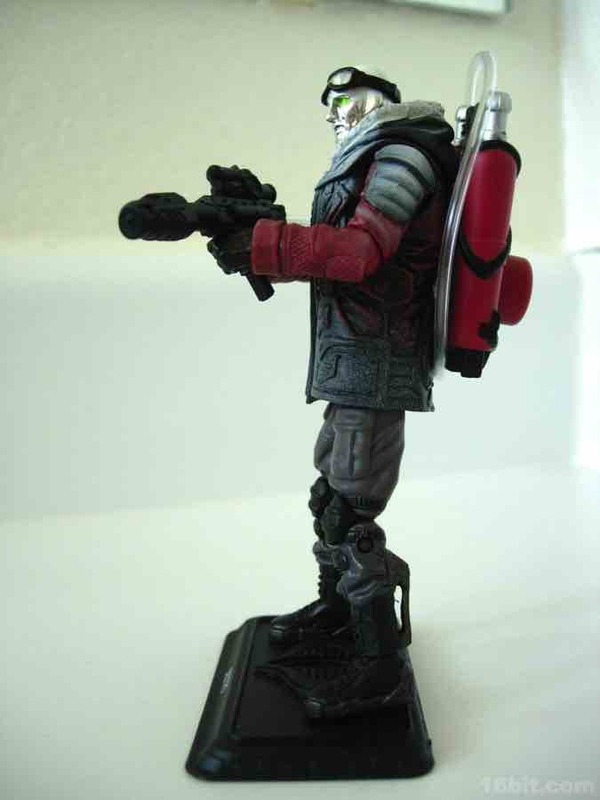 It's a nice (and unusual) add-on as very rarely do any Joes include gear to use with other toys-- basically it's all for the toy you buy, not for the other toys you might play with. This is a great example of forward thinking and giving kids an excuse to buy another figure. While goofy-- and actually quite flawed from an execution standpoint-- this is one of the more creative figures in the line. My first impressions were overwhelmingly positive, were it not for the paint coming off this would probably be one of my top 3 G.I. 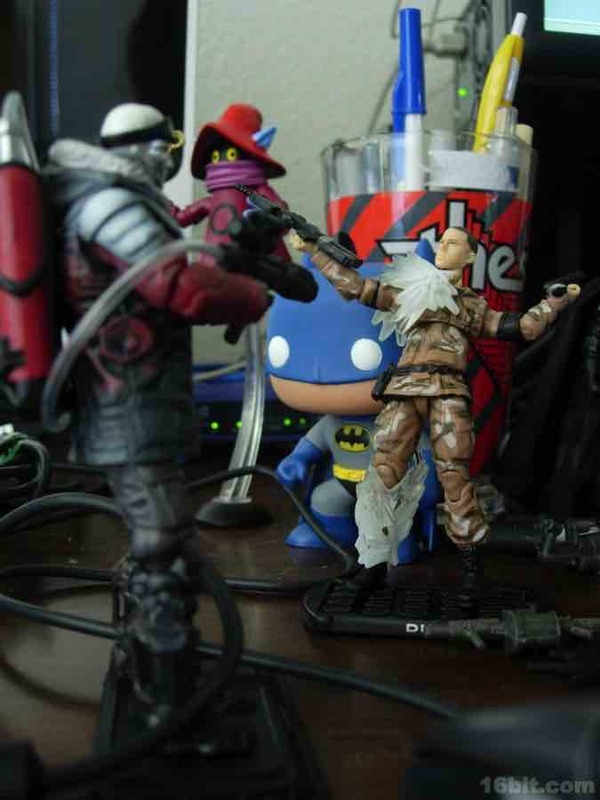 Joe figures of the past several years. Hasbro has shown a lot of creativity with homages to other toy lines in Pursuit, and if you can play carefully with this one, I think you'll like it a lot. It's way better than getting "Snow Serpent Commander."